To develop expressions of beauty and enjoyment in an industrial setting, one must seek to create a space that is in harmonious dialogue with its surrounding environment. Through the creation of provocative and intriguing site elements in her design, Addie aims to allow visitors the chance to explore the interior and exterior portions of her site with great ease. 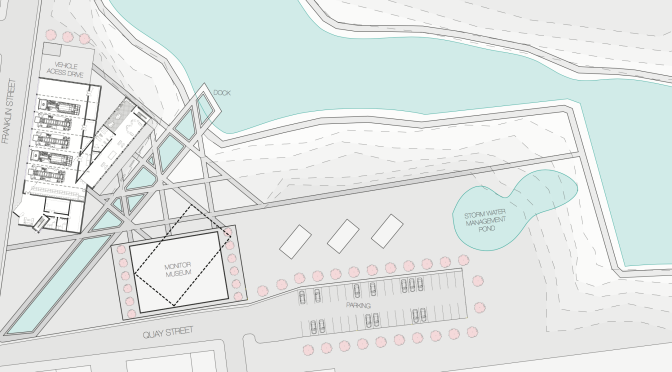 Addie aims to accomplish this task with the creation of a central water feature that extends from the intersection of Quay St. and Franklin St. to the waterfront portions of her site. By positioning her fire station parallel to Franklin St. and her Monitor Museum parallel to Quay St., Addie emphasizes that her project is about the creation of collision points through repeated axial tension. By reviewing Addie’s project in conjunction with my review of the NAAB requirements (and of those set forth by our studio professors at the beginning of the year), I believe that she had an extremely successful Design Development process. The programmatic design of her fire station, which is centered on the ideology of efficiency, is well thought out and her site as a whole is very well developed. The layout, hierarchy, organization, and color choices of her board were excellent. That being said, I believe that Addie still has several decisions to make regarding a few key portions of her project. Further attention directed towards these areas would help to turn this project into one that is truly excellent. First and foremost, I believe that Addie should spend some time adjusting the central water feature of her site. This feature is made up of a series of cascading pools that gradually descend down to complement the topographic elements of the site. The decision to begin this series of water features at the intersection of Quay St. and Franklin St. is wise; however, I feel as though the direction in which the rectangular water feature takes its guests interrupts the circulative elements of the site as a whole. Because of the water feature, I am drawn to the central area of land in between the fire station and the Monitor Museum. That being said, the main entrance into the fire station exists off of Franklin St. on the opposite side of the building. While the Monitor Museum exists only in mass, the water feature’s corresponding pathways lead me to believe that the main entrance to the museum lies on the south-facing portion of the building, despite the parking lot for the museum existing on its northwest side. I also feel as though the grand scale of the water features suggests an axial importance when standing at the bottom of them and looking up and while standing at the top and looking down. While there exists a fantastic view of the Manhattan skyline when the viewer looks southwest, no such view exists when looking northeast into the urban portions of the surrounding site. I applaud Addie’s efforts to create a separation of private (living) and public (apparatus bay) spaces. I also appreciate the observation deck platform that she has created above the apparatus bay. That being said, there appears to be a tendency to label non-orthogonal rooms as “laundry” or “restroom.” While these rooms might technically fulfill the square footage requirements as they are outlined in the program, much of the space in these rooms is not usable, especially given the orthogonal qualities of the equipment that is intended to be stored there. Addie was fortunate to be able to receive feedback on her design from Malcolm Woollen, Christine Gorby, and Peter Aeschbacher. 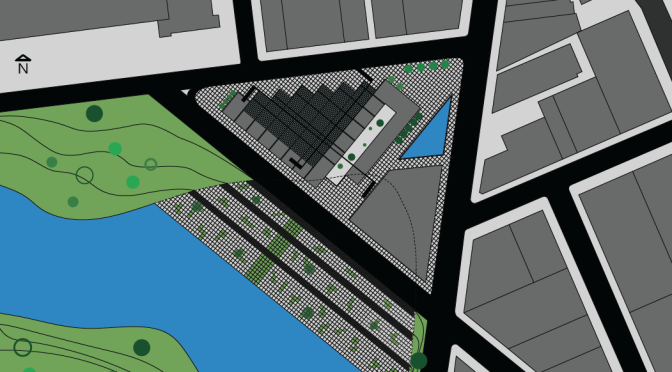 All three reviewers were appreciative of Addie’s extensive site development and they applauded her decision to begin the water feature component of her site at the intersection of Quay St. and Franklin St. as a means of creating a sort of axis (or promenade) around which to lie out the programmatic elements of the site. As a result of the grand nature of the site’s development and Addie’s thoughtful gestures in ensuring that visitors to the site walk away being profoundly impacted, these comments tended to fall underneath the category of “inspired.” That being said, Peter acknowledged how, through the creation of this heavy axial element, Addie has now made the buildings across the intersection of Quay St. and Franklin St. some of the most important views in the entire site. He also felt as though this water feature almost “ran out of space” where it met the intersection. That being said, the reviewers thought that her concept was quite strong, but that she could relax many of the diagrams to better complement the natural components of the site. Peter also questioned her decision to end the “manmade” portions of the site with a parking lot. He felt as though a boardwalk promenade would be a great addition to the site plan. Christine focused the majority of attention at the intersecting qualities of the first and second floors of Addie’s fire station. Because of her decision to intersect these floor elements at a non-orthogonal angle, many of the rooms and spaces at this intersection are oddly shaped. What seemed to be a main focus for the reviewers during this period of the critique were the public restrooms on the first floor of the fire station. Peter likened these restrooms to a men’s restroom at Ohio State University. This restroom stuck out in Peter’s memory because he remembered having to contort his body into and out of the space. Christine suggested utilizing more transparent and translucent materials at this collision point as a means of making it a much more dramatic element within the design. As it stands, Christine felt as though Addie created a great deal of tension in this element and then suddenly closed off that tension. Many of these comments would fall under the “domestic” category because they centered on such facets as habitation and the mood of the firefighters that would have been created from being in the many organic environments within the design. The reviewers felt as though the creation of a larger model would help Addie in addressing the aforementioned design issues. This model will also assist in further developing the ventilation elements of the structure. The reviewers also suggested that Addie “beef up” the entrance to her fire station by extending the “overhang” element of this entrance out over top of Franklin St. I really enjoyed Addie’s project. She has a very strong concept and, through her designs, she has shown that she has a mastery of the site. She is at a perfect stage in her project in regards to making the necessary corrections for the final review in three weeks. I would first recommend that you take another look at the circulative elements of both the site as a whole and of the fire station specifically. There are already many great components of the design and a simple rethinking to several small portions of it would help to strengthen the project as a whole. Perhaps creating circulation diagrams representing visitors to the fire station with cars/walking, visitors to the Monitor Museum with cars/walking, visitors to the park with cars/walking, and how the firefighters would navigate throughout the space in an emergency situation would assist in this process. You might also find it helpful to partially design the entrance and exit portions of the Monitor Museum so that you know the exact direction in which your visitors will be traveling. I also recommend that you adjust the collision point of your fire station to match the intensity of your design for the site’s water feature. Relaxing the “manmade” portions of your site to blend into the site’s natural elements might also be an interesting development moving forward. From the very beginning of this project, Li was determined to design her building using circular geometry. Despite warnings of frustration and discouraging advice from reviewers, Li stayed strong with her intent of using circles. For that, I respect her; because she kept with circles, her concept has remained strong throughout the project. Of course, circles are hard but her project is coming together. What Li said about her work/ what was on her board. The reviewers’ comments and their “order of worth” about what she said and showed. My two cents and advice. the cylinders are reminiscent of the industrial tower/drums that appear elsewhere on the shoreline. These are not good enough reasons for using circles. Circles are a difficult problem so you need a very strong reason to use them. This comes from an “inspired” perspective because they attacked her very concept. I think her reasons are valid but Li needs to beef them up so that her project could not use anything else but circles. For example, a fun environment can be achieved with squares or triangles. Regardless, I think ” fun” is the wrong word in this case. Maybe inviting is better because the curves draw you in and invite you to stay. Circulation paths might be another strong reason for using circles. How does the circulation of firefighters improve with circles? I could see a cool diagram explaining this because people don’t walk with corners in the middle of their path. Each cylinder houses a different piece of the program and are connected by a balcony path. I like this a lot! It allows firefights to get down to the apparatus bay from their bedrooms quickly and is also social connection between the other programs. As much as I enjoy this path, there is an opportunity that Li is missing with the roof of her apparatus bay which is just below her path. I can see the path floating and moving around a wonderful green place where there is stillness and hanging out. It could be a green roof space with shaded areas under the path. I believe that area has the view to Manhattan as well so having a gathering space there would take full advantage of that. This would also make the sections more interesting and make for a great rendering. Li used circular geometry for almost every wall and element in her building. There are a few straight lines. If you’re going to do circles, there should not be one straight line in your building! I totally agree here; It will only strengthen her project. My suggestion, if Li can’t sacrifice the straight geometry of these walls, she should replace the straight lines with a very shallow curve/large radius. That way, it’ll be curved but it’ll take up roughly the same amount of space that a straight wall does. One of her straight lines is a path by the street that “reacts with the street”. I think what she is trying to do is make the spot where her geometry meets the city grid softer and blended. I think that if she used circles to contrast with the grid, that moment should blunt, not blended. Li didn’t show furniture in her drawings. How are you going to furnish your buildings? Furniture as it is is not designed for circular walls and if they exist, they are expensive and rare. Also, how are you going resolve the doors and windows? These comments come from an industrial and practical point of view. This is not the first time furniture has been brought up. I think Li should come up with some quick furniture designs that are easy and cheap to make and exactly fit into the geometry of her project. I could see her coming up with furniture that you CNC and assemble. Cutting flat-packaged furniture allows her to make any kind of shape she wants and can be really cheap. The hardest thing to resolve will be the beds because mattresses are rectangles. Therefore, laying out her rooms and resolving the leftover spaces with furniture she designs will finally shut the critics up about furniture. The door issue may be resolved by making a small section of flat wall for the door while the facade curves above it. I am not so sure about the windows but curved glass is not unheard of though probably hard to do. With all three of these issues, Li really needs to do some research and see how her precedent dealt with them. There might be simple solutions out there that she does not know about yet. As far as landscape, Li has a circular area designated as a lounge space and otherwise kept the site as it is which is covered in wild grasses. The reviewers did not like this but did not give her many ideas to work off of. They said the site is uninviting and very underdeveloped. They wanted the public to feel like they belonged in her park design which comes from a civic point of view. I’m really excited about the possibilities of Li’s site design. Keeping with the circular geometry will make for some really cool spaces. I suggest creating circles at different levels to make sunken gathering spaces or built-up, playful hills. Maybe one circle is a reconstructed wetland, or have a circular dock going out to the river, or a reflecting pool. The in between spaces could be circulation or a place for trees. The fact that trees are circular in plan is something Li must exploit. Trees are a great way to make barriers, sheltered spaces, and effects the way people interact with site. Li’s model was very well done. She used a piece of plexiglass for the roof of her first floor so that you could see in and I thought that was pretty ingenious. This way of building revealed a structural problem with one of her cylinders though; it is pretty much floating with no cantilever support or columns. Adding columns may cause problems in the floor below so she may have to play with layout or find a more creative way to achieve a column-less space. I think her drawings were well done and her use of textures made them look elegant. I appreciate the fact that there are no hard corners and that each radius exists elsewhere in the drawing. I was assigned to attend to John’s review and make comments on his work. His concept for his project is basically the shape of the apparatus bays and the orientation of them. He did a lot of site manipulation regarding the extension of one of the roads of the site and then he shaped his building based on the orientation of the apparatus bay sizes going hand by hand with the extended road. He has some interesting aspects in his project. One of them is the idea of having the residential area on a second level, above the apparatus bays and storage areas. By doing this, he had an interesting view from the residential area, looking down into the apparatus bay. I think that this idea is really strong because there is a clear emphasis in the views and the connection between the upper floor and the apparatus bay. Regarding daylight and natural ventilation, John decided to go with the idea of having a glass roof above the apparatus bay that brings sunlight into that space and also there is an opportunity for natural ventilation if that roof has operable windows to some extent. He also tried to address the idea of circulation, especially for the fire fighters on how to get from the residential area into the apparatus bay in order to maximize efficiency. I think that the comments on John’s review were both positive and negative but all of them helpful in order for him to move forward regarding the next steps of design process even though we don’t have a lot of time until the final project is due. Regarding John’s board and presentation, I think he did a great job in terms of board composition including drawings both in plan and section, diagrams that explained his concept in a clear way, two perspectives showing important spaces of his building, and a site plan that addresses the connection between his building and the landscape and how is the making that connection. I think that in terms of the perspective that he showed in his review, for the next one I will make them bigger so they can occupy more space in the boards and emphasize its importance. I suggest to John also the idea of having a perspective form the second floor, overlooking the apparatus bay because I think that space is an important one in his project and it will be good if that space is emphasized in a good way. Also other suggestion includes the idea of making the diagrams in a different way. I think that the diagrams that John showed in his review were very clear but at the same time very simple. Maybe for the next review he can try making them as axonometric and include more information. Also one other thing that John did a pretty good job on is including pictures of precedents. I think this is a very important aspect that a lot of people don’t pay close attention to. Including precedents in any presentation shows that the designer took the time to investigate projects that presented similar ideas to have he/she wanted to do. It makes the project look better and stronger. Like I previously mentioned, there were positive and negative comments that the reviewers had for John’s project in his review. They often expressed the simplicity of his design being a positive aspect and how he look part of site manipulation and building placement in a good way. Some of the other comments included the articulation of the elevations in order to show the building as a continuous bar. They mentioned that in plan view, his project shows a clear continuous bar going from one corner of the building to another. That idea was not expressed in a good way in the sides of the building and that is one of the things that John has to work on. Also they mentioned the idea of having a big massive circulation on the second floor and the idea of having the roof also served as part of the second floor and not only the first one. One of the other aspects of his building that they focused on was the extension of the road in order to create boundaries for the site in the area of his building. They said that there is a really tight space in between the edge of the building and the road in order for the trucks to maneuver and get out of the building or get in. He has to articulate that space in a better way and give more space for the trucks to go through the road and get inside or outside the building in an efficient and fast way. The reviewers, especially Jamie Cooper, kept talking about the facades of John’s building and that they don’t express the same idea that the roof is. Focusing on the fire trucks side façade, they mentioned that it was kind of simple and not articulated in a good way and that he had to rethink this approach to that. They suggested the idea of articulating the bay size (or door) all around the building and make it speak the same language. Regarding natural ventilation and sunlight, they suggested the idea of having solar panels in the roof for light and electricity and in that way make the building serve as a sustainable place as well. I think that the reviewers gave John good feedback in order for him to move forward on his design. I think that they focused more on the articulation of the facades and how to make the building speak the same language in every part of it. They also focused on how is John treating the connection between the building and the site, and they said that he might want to consider that aspect and make it look more clear and better. I think that the organization of the landscape is simple and clear but maybe John will want to emphasize more the circulation paths of the users around the building and the connections from the doors of the building to the landscape and the outside spaces. Overall I think that John’s project is strong and clear. His concept is clear and the way in which he treated all the parts of the program to fit his concept was done in a good way. Like all projects always, there is some stuff that has to be change or modified to make the project stronger and to look better. I think that if John takes the advise from the reviewers on how to move forward and the things that he has to change in his project, he will make his project stronger and better for the final review. Preservation of public usage of the site is a driving feature within David’s design. This concept is something that inspired both form and program throughout his project. The site is at the corner of two streets, resulting in an irregular corner. Dave began his formal organization by extruding along the axis (street) that travels from the east river towards Greenpoint. When the form arrives at the intersection at the corner of the site, it doubles over itself and travels back down the second axis (street) that travels roughly north to south. This ribbon-like folding is the primary formal gesture and shapes the building entirely. The buildings ends are defined by two streets that intersect with the axes of the building. The truncation of the building at these two streets creates an open passageway of view from both cross streets towards the inlet and the east river respectively. The ribbon-like movement is also following this preservation of public space and views. The east-west component of the building is along street level and facing the nearby residential spaces as well as some commercial areas. This side of the building is two stories and keeps with the scale of the buildings it borders. The north-south side (the folder portion of the ‘ribbon’) is elevated to a third level, leaving a two story clear underneath to function as community space. This also allows views from a nearby cross street to be framed towards the east river. This continual theme of the building as an anchor of public space is continued programmatically. 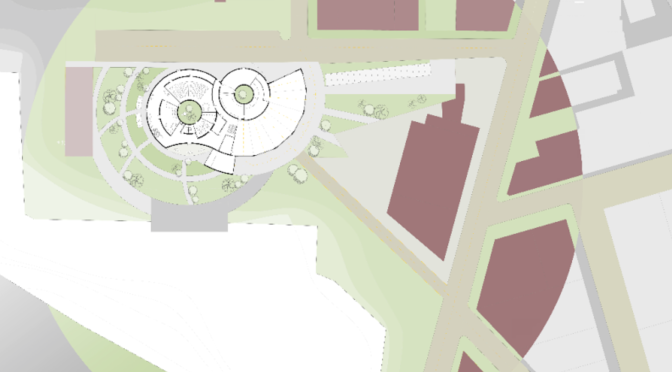 At the intersection to the north east of the site, there is a major setback of the building to the point of creating a public plaza for use as a more urban open space on the site. This is connected directly to the park by a pass through the fire station. Programmatically, the portion of the building running east-west is comprised of the administration and apparatus portions where as the north-south volume is elevated and residential. The critics appreciated the formal gesture of wrapping this project around the primary intersection that borders the site, but questioned some other aspects. One instance of this was the streets that shaped the ends of the building. While the east-west portion of the building is stopped at a historic street allowing for the continued view to the inlet, the other side does not follow this rule. The north-south portion of the building passed by two intersections before ultimate choosing one to end at; something the critics viewed as arbitrary and of another language from the rules of the other side. While there is spatial need for the continuation beyond the first cross street, this seems like a decision that is not coherent with the other side. Another key issues brought up at the review was the usage of the roughly 60’ x 120’ space under the elevated north-south element. While it is completely open and could serve as a public space and access to the park, its not an enjoyable space as is. The roof above the space is solid and has no skylights, leading to a dark and undesirable space. Another critic voiced concern about possibly creating a wind tunnel coming from the east river and being channeled by the east-wet path. This is all topped off by the issue of this space currently not being programmed. The critic’s conclusion was that while it had a high potential to operate as a wonderful public space, it wasn’t at this point just yet. Another point of talking during the review was the continuity of the concept throughout the project. The concept is centered around the ribbon like form that twists over itself to shape spaces. 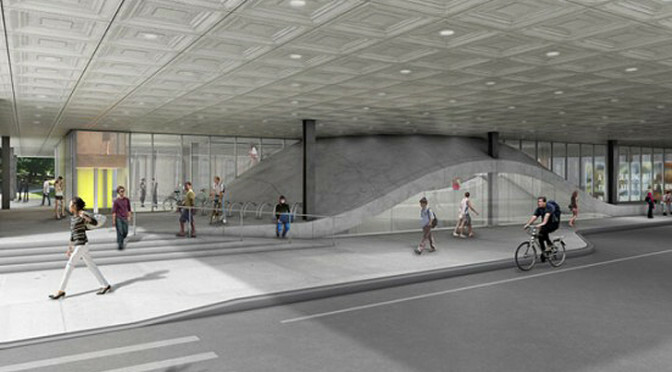 The critics believe that the ribbon motion of the building would not be apparent to users or onlookers of the project. Some of their suggestions about changing this was to either create a smaller element on the façade that wraps around the twisting or have a material connection that flows from the top of the east-west axis to the bottom of the north-south axis. This visual connection will strengthen the concept and continue to shape the form. Another item discussed during the crit was possibly switching elements orientations as the form folds on itself. This is a concept that may take the form of: window height, lights from ceiling vs. wall based locations, HVAC switching from ceiling hosted to floor hosted, and many other opportunities throughout the project. Conversely with the former discussion about façade, this would create an interior continuity for the intimate users of this space. Dave’s presentation possibly tended slightly too much towards a walkthrough of the project. The description of the concept may have been a little too short and lead to some redundancy in the conversations following about what the concept truly was. Overall, I think this critique represented a project in progress. Dave had taken quite a few steps back into the conceptual and formal design realms just before this crit. While this resulted in a product that may not be fully thought out yet, his new concept of a ribbon-like flow is incredibly strong (and definitely stronger than previous concepts) and is something that can inform decisions throughout the entire project. Currently there needs to be more work put into finalizing the concept in reference to form and program, and then it can applied to more technical elements. Some of these NAAB requirement including site, structure, precedents, and ADA will be integrated once there is a cohesive set of logic for the project, and can ultimately provide a productive dialogue between form and these requirements that will enrich both parts. At this level of development, the critics focused the discussions mostly on the aesthetic orders of worth, as the more technical components were not fully developed yet. Inspired, Fame, and Civic are the orders that come first to mind with the project. Its scale, relation to the site, and ultimately formal logic gesture towards these orders. There is definitely possibility to transition towards other orders as the project progresses into the next, more technical components. One of my first suggestions would be to program and spatially differentiate the space under the north-sough portion of the program. I believe that by adding openings in the building above to let light in and possibly raising or lowing the area underneath to differentiate it from the rest of the park will create an entirely different space. To deal with the problem of continuity of form and making the ribbon like motion apparent, I think the critics stated it best by having both a façade element that traces the trajectory as well as internal elements switching orientations as previously mentioned. Finally, I think the north-south portion should be truncated at the first cross street and then seek to relocate the extra program elsewhere to have a continuous formal logic. Overall I think the next step for this project is to first resolve these problems and then delve into finalizing structure and ADA considerations. A connectivity towards the community is what is illustrated in Stephanie’s proposal. The project explicitly communicates the sense of stacking and interaction with levels. It marks a continuous embrace of height and spaces where the programs are divided in an orderly manner. The location of a central passage connects her building as a whole, which at the same time priorities, the movement for the firefighters. However, the jurors did not view the project as such. Given Stephanie’s substantial presentation of her proposal, some of the jurors were not followed and were lost in thought. In fact, Peter Aeschbacher was confused with building features that Stephanie did not explain well. This led to the contradiction between the program and her explanation. In contrast, Jurors were following Stephanie’s presentation since the beginning to the end, which allowed the jurors to understand what she meant. While her posted illustration were welcoming, her models were far from finished. Ideally, one uses the model to support one’s argument; however, some of the drawings were informative and understandable compared to the model. The model seemed to portray a different scheme than what was given. Looking at the elevation, one can automatically see the play of level and changes in sizes. The elevation clearly flattened the conceptual scheme seen on the model and would have been better to have an axonometric elevation that displays the stacking and connection to the program. Apart from the given diagrams, the legibility of the plans and elevation could have been successful by adding 3-dimensional elements. Identifying the conceptual design in Steph’s project is straightforward by looking at her elevation and the conceptual model. The idea to bring the community to the site and collaborate with the museum and the firehouse is a solution that satisfies the future development of Greenpoint. The manifestation of a future development for Brooklyn’s school and the Bushwick Inlet is envisioned in her project. The incorporation of the Fire station to the modern museum allows the site to unite as one allowing the public to experience a site dedicated to the community. Division between private and public is openly seen by looking at her model and floor plans, which Steph has done perfectly. Looking at the building, a firm division starts to create a transition from where the firefighters reside versus the community usage without displacing the importance of both functions. A unique scheme that conveys a story from the exterior to the interior, which both community members and dwellers can experience. The interesting part of the building, conceptually, is that the recreation room tops the dwelling section creating a simultaneously division yet unison form that both sections of the users can utilize. In most cases, buildings focus on incorporating the community with the users, but forget to relate to the community that would eventually surround the area. The separation of levels by usage and convention allows a standard precedential aspect of the building to resemble a common characteristic yet breaking of the shell that mobilize the form to create her building. Her schematic design highlights and builds up her conceptual scheme that allowed her to proceed with a better understanding of her building. Stephanie’s building design developed in a good manner and captivating way from her conceptual idea. Her materiality emphasized her initial idea to unite two domains into one. The use of wood panels within the concrete structure seems to alleviate the heavy aesthetic of concrete of the building. The wood articulates a calmer look for each section of the building while the concrete frames each part of the building. The concrete frame allows the building to signify its position from its surrounding and the site. Additionally from the wood panels, glass helps the building by illuminating the opening in the interior space. This allows a sense of non-restricting usage from the usage. While the usage of panels and glass helps eradicate the strong presence of the concrete frame. It would help if the wood materiality can be experience in the interior space, as this is what allows the firehouse to create the connection to the community. Aside from concrete and wood, green elements are clearly seen in the roof. While the green roof helps manifest a sustainable design. It fails if the green is placed after the conceptual and is not integrated with the site or functions as part of it. A community roof garden should be visible from the building, accessible from the interior, and exterior. Jurors sought that by utilizing the site instead of the building would benefit the community in a much better way. In truth, by separating the roof garden from the building this abstain the idea of uniting the community with the firehouse. By utilizing a passage from the site to the roof, it would reduce the foot traffic of going inside to the building. Stephanie’ seemed to incorporate solar panels that are located next to the community garden. Instead of placing the panels next to the community, the panel could be placed on the recreation roof. By moving the panels, the garden would be free of any obstacle that would cause a damage. Overall, Steph’ held an excellent presentation that allowed the jurors to be part of the communication presentation. Even though there were some misunderstanding, she directed the jurors on what point she must exceed for the final. Her project was one of the few that really strictly incorporated many of the community development that would eventually be located in the near future. By thinking far ahead of the usages that are, going to be, part of the surrounding is a task, in some cases, no easily achievable. Her visual presentation was vivid and elaborated the points of her project. As of this point, her project has yet to fully grown into the project she expects it to be. Her ideas and approached were farther than realized; however, growing one design is part of what makes us architecture students. We learn from our mistakes and fix them as time progress. For the final, Stephanie’s presentation and project would have evolved and grown that jurors would immediately understand.